Discussion in 'Software News' started by mono, Jan 9, 2019. 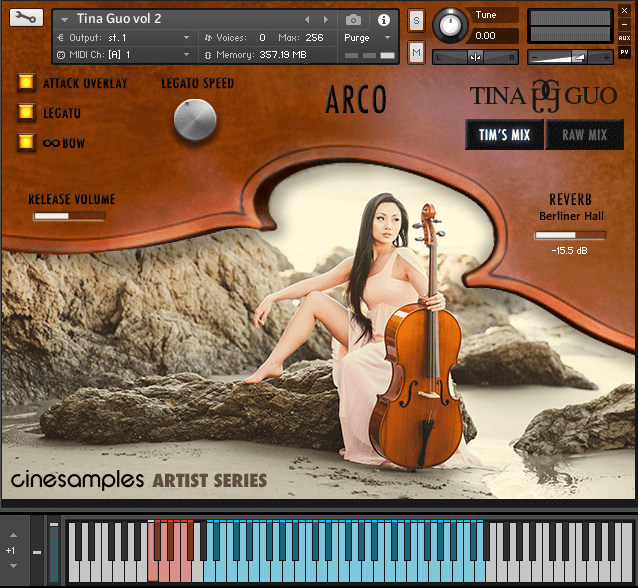 Cinesamples has announced a new volume of the Tina Guo artist series of virtual cello instruments. Where Tina Guo Acoustic Cello Legato features a romantic, espressivo style of playing, the new library allows for an agile, more connected style of playing. Faster playing naturally allows less time for vibrato on passing notes. Volume 2 also features more articulations not available in the original library. Tina Guo volume 2 is a valuable expansion of the original Tina Guo Acoustic Cello Legato library utilizing the same unique seamless legato recording and programming techniques. The legato in volume 2 allows for more agile melodic passages and additional articulations including spiccato, marcato, harmonics, sul ponticello, and vibrato pizzicato. Combining volume 2 with the original library provides a complete combination of Tina’s solo acoustic cello. Recorded at the MGM Scoring Stage at Sony Pictures Studios in Los Angeles. Tine Guo Vol 2 is available for $99 USD. Requires Kontakt 5.6.8 and above (incl. the free Kontakt Player). Oh those legs sound so nice . I have this Release i can uploaded it for all? If you see a moderator tell me so I can ask him Won't take any spell ! Awesome Remember it goes on sister site, not here.